This device is a semi-automatic cement air permeability tester used for specific surface or Blaine value. Two test methods are given: test method A is the reference test method using the manually operated standard Blaine apparatus, while test method B permits the use of an automated apparatus, which has demonstrated acceptable performance. The Blaine air-permeability apparatus consists essentially of a means of drawing a definite quantity of air through a prepared bed of cement of definite porosity. The Blaine works by drawing a definite quantity of air through of bed of cement exhibiting a definitive porosity value. The number and size of the pores in a prepared bed of definite porosity is a function of the size of the particles and determines the rate of airflow through the bed. This procedure is outlined in ASTM C204, Method A and AASHTO T153. The standard Humboldt Blaine Air Permeability Apparatus consists of: calibrated U-tube manometer, ground glass joint, stainless steel test cell and plunger, rubber aspirator bulb and perforated disc. Includes an 8 oz (226.8g) bottle of red manometer fluid, filter paper, wood block for holding test cell during filling and a funnel. Mounted on finished wood panel with rubber-footed base. To perform this test, NIST Portland Cement #114q is required by the ASTM standard for calibration. The Semi-automatic Blaine Apparatus provides more accuracy and precision than provided by the manual Blaine Apparatus. Calibration of this unit is done using a cement sample reference, such as NIST 114q. To obtain the most accurate results, the test should be performed in a temperature controlled environment. Unit inlcudes: the unit with an electric pump and time registration; filter papers ( 12.8mm, 1000pk; fill oil (50ml); Plug; thermometer; brush and funnel. Humboldt also carries a selection of automated Blaine apparatus. The PC-controlled, electronic Blaine Apparatus, Dyckerhoff system provides a fully automatic test procedure and evaluation, complete with software, for one cell. Once the test material is set inside the chambers, the test procedure is able to measure the values for the user. This device provides quick test preparation, which does not require the operator to determine the weighed quantity, as precise as he would for the standard procedure. After test preparation, the device can perform the test in full automation, recording all information without need of supervision Measuring cell dia. is 41 mm (1.6"). Volume of measuring cell is approximately ca. 75 cm3. Comes complete with digital indicator, fill oil, syringe with tube, tamper, round, 41mm filter paper (500pcs) and 13mm dust filters (10pcs). 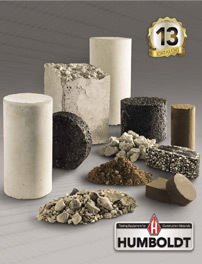 Humboldt provides a wide selection of cement and mortar testing equipment. If you have questions or need help selecting equipment, please call us at 1.800.544.7220 or use our Quick Response form.